Bill Lothian was the guest speaker at the monthly meeting of the Memories’ Club in the Mains Park Clubhouse. Bert Lawson kicked off by giving the usual admin info, and caused a titter to run round the audience when he announced that cheques of £150 had been given to the Caring Cafe and Alzhiemers Scotland but he couldn’t remember the location or the people involved! 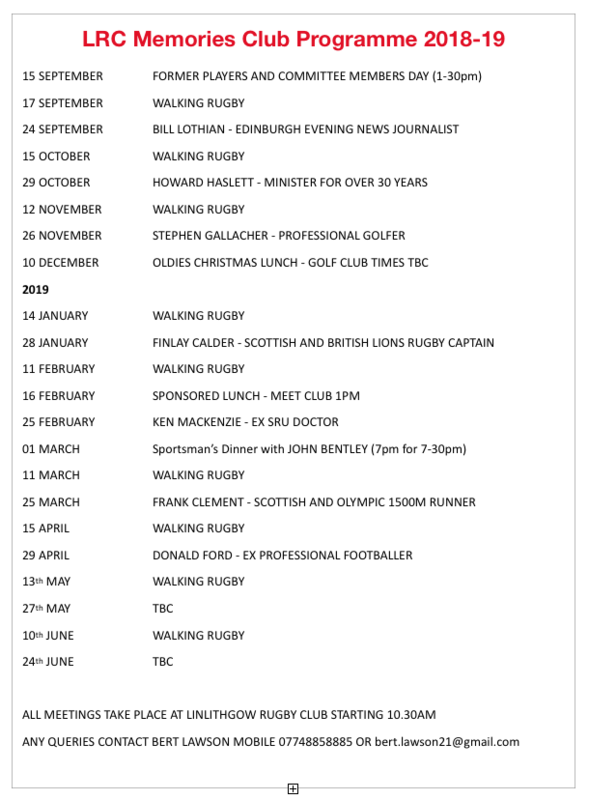 A Sports Journalist with the Scotsman and Evening News for 40 years, Bill Lothian covered a number of events, but mainly those related to rugby. He is a champion of lost causes, no more so than Meadowbank Stadium, although hopefully there is successful end to this one. When asked how he had managed to stay with the Scotsman for forty years he replied because they never found him out! Bill had a number of hilarious anecdotes related to journalism and foreign rugby tours. When criticised by an Evening News reader about an article he had written, he said on a Saturday night you can also get a white pudding supper in the Evening News. On a tour of New Zealand one of the players wanted a bacon sandwich, but was told there was no bacon. He said ‘What – you have 30 million sheep and can’t even get a slice of bacon’ ? The definition of a sports journalist per Bill is someone who gets paid to see what you were coming to anyway. After coffee and cakes there was a discussion about the way forward for rugby in Scotland, and the club president Ken Richardson set out some of the thinking from the SRU, about the Super Sixes, professional, semi-professional and the amateur game of rugby. A round of applause was given to Bill for a very entertaining morning. Remember that the Memories’ Club also do walking rugby, so come along and play, as long as you are not worried about getting injured.